A fun potluck party idea is to have a zucchini fest. People can be so creative; you’ll discover zucchini dishes you never dreamed of. I’ll never forget going to one several years ago and someone had thought ahead and brought a gluten free chocolate zucchini bread. Too many times, we forget the many who don’t eat gluten (wheat products). My busy gluten free neighbor Vanessa shares this recipe – gluten free chocolate zucchini bread. It is so yummy and rich, it can be treated as cake. This is a proven winner recipe; it won’t last long in the pan! Enjoy the zucchini season while it lasts…and lasts…..and lasts! In a large bowl cream together the applesauce, coconut oil and sugar. Then add the eggs and vanilla and mix well. In a separate bowl, whisk together the brown rice and pat flours, cocoa powder, cacao, baking powder, baking soda, cinnamon and salt. Add 1/2 of the dry ingredients to the batter and mix, then add the coconut milk (with the vinegar) mix, and add the remaining flour mixture. Mix until well combined. This is a good time to teach patience to little ones while the batter mixes. Good things come to those who wait! With supervision and a little help, young children can take pride in helping make this delicious zucchini treat! Pour the batter in the pan. Be sure to smell it as you examine your batter. Bake for 30-40 minutes until a toothpick inserted in the center comes out with moist crumbs. In my convection oven it takes about 34 minutes. This can be served with whipped topping or your favorite ice cream or ice cream alternative. If you have already pulled up your garden, don’t worry. I’m sure someone has excess in their garden. Just put out the word that you will make some gluten free chocolate zucchini bread for them if they will give you some of their zucchinis. If you find this too late, make plans for various zucchini plants next spring. There are many varieties to choose from at your local garden center. September is the special month of the year that is set aside to celebrate the wonderfully dependable, always reliable potato. This solid side dish performer works with almost any meal and if you planted potato starters in the spring then you should have a harvest ready to be served up this the fall. Mashed potatoes are always a solid side dish but if you’re looking for something different here are six ideas for side dishes this month as you celebrate the potato! Hashbrowns – Who says that hashbrowns have to stay put on the breakfast menu? Try serving them at dinner and adding in bell peppers, onions, and your favorite spices for flavor. Serve the hash browns with a traditional dinner menu or make it an evening of breakfast. It’s always a good time for pancakes and bacon! Funeral Potatoes – A Utah classic, funeral potatoes are a satisfying comfort dish for any occasion, even a weeknight family dinner. Potatoes can be diced, sliced, or shredded before you add them to the recipe. This potato dish can be as simple or as elaborate as you want to make it, the varieties are endless. Here’s a basic funeral potato recipe from Lil’ Luna to get you started if you’ve never baked this comfort food before! Baked – You can’t deny the simple, great taste of a baked potato. Toss the potatoes in olive oil and kosher salt before baking and they’ll come out of the oven crisp on the outside and warm and fluffy on the inside. The beauty of the baked potato is that each family member can create their own. Whether it’s with simple butter and salt or fully loaded with sour cream, bacon, cheese, and green onions, everyone will have a say in how this potato dish is made. Grilled – While the weather is still warm outside you may not be in the mood to use your oven to cook potatoes. If that’s the case you can always grill them. Grilled potatoes are an excellent choice when you’re already planning on grilling meat for dinner. Slice or dice the potatoes and then put them in a foil packet. Don’t forget to spray the foil with non-stick cooking spray to prevent the vegetables from sticking to the sides. Add in bell peppers and onions or cheese and bacon, depending on your taste preference. Seal up the foil packets and place them on the grill earlier than your meat as the potatoes will take longer to cook. Potato Salad – Potato salad isn’t only a dish for summer potlucks! If you find yourself in the mood for a potato side dish but want something a little lighter, try a potato salad. You can stick with the traditional recipes or try one that’s eggless, or a version that uses red potatoes and vinegar. Potato Wedges – Celebrate the potato with homemade potato wedges. They are about as family friendly as you can get. Wedges can be served with simple, kid friendly main dishes or fancier adult fare. While cutting the potatoes can seem like a chore, in the end the homemade taste will be worth it! Try this recipe from Our Best Bites for oven fries and experiment with the different seasoning. Enjoy the month with your homegrown potatoes, but if you didn’t grow any, plan ahead for next spring. Western Gardens carries in the spring a variety of only the best potatoes to grow in your own garden. You will be able to celebrate the potato even more next September. Hello! I’m Jenn from Housewives of Riverton and am so excited to be here with you today. Did you know that August 8th is National Sneak Some Zucchini Onto Your Neighbor’s Porch Day? I am absolutely loving these different national days and have so much fun coming up with ways to celebrate them. The funny thing about National Sneak Some Zucchini onto your Neighbor’s Porch Day is, what person (who has a garden) isn’t going to be over the moon excited to celebrate this day. I mean, if you were to start putting some of your zucchini abundance onto all your neighbor’s porches on just a random Tuesday people might think you were weird BUT make it a national day that you can include on a fun note and it’s perfectly acceptable to share the zucchini love! As I was thinking of different ways to celebrate this fun holiday I started thinking of some of my favorite zucchini recipes. I think zucchini bread has to top the list, I like to pretend it’s completely healthy because it has quite a bit of zucchini in it, perfect for those days when I’m dieting. I don’t want to make National Sneak Some Zucchini Onto Your Neighbor’s Porch Day a chore for you so I am not suggesting that you make zucchini bread for all your neighbors but you could include a recipe for zucchini bread (or cookies, cupcakes, brownies…there are so many delicious zucchini recipes) along with the needed amount (or more) of zucchini. You may just introduce them to a new favorite recipe. To help make this day and the giving easier for you, I’ve created this fun free printable for you to include with your bounty. CLICK HERE to print it off! I think that cute smiling zucchini would make anyone’s day brighter, he just seems to scream “Hey you, I was thinking about you today!” and everyone loves to be thought of. I say plan ahead, don’t let this fun new holiday sneak up on you, collect your zucchini abundance, print out a few of our free printable and maybe a recipe or two and hit the neighborhood on August 8th and bring a smile to the faces of your neighbors! If you’re looking for a fun new way to eat your zucchini you’ve got to try our Zucchini Cookies with Cream Cheese Frosting or our Applesauce Zucchini Bread both are serious crowd pleasers and are sure to have your friends and family asking for more zucchini from your garden! Check out our National Zucchini Bread Day recipe as well. 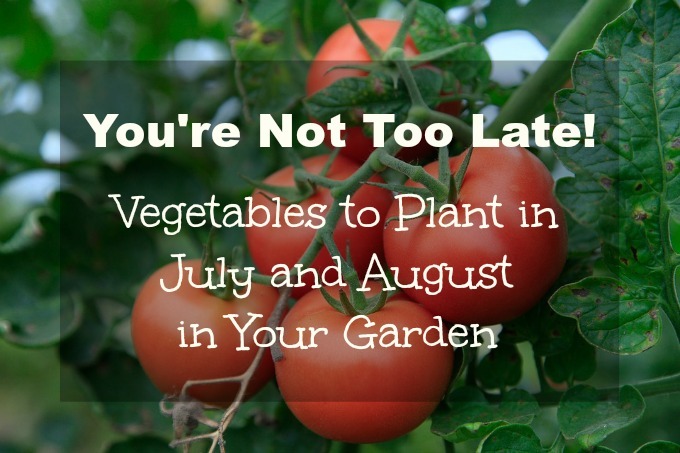 The calendar may still say “Summer” but believe it or not, it’s time to start thinking about planting your fall garden! I tend to think of planting my garden as a springtime activity but there are many plants that thrive in cooler conditions and will produce a harvest of healthy foods. Here are five green veggies that you can plant now and enjoy when sweater weather truly kicks in! Broccoli- Broccoli is a cool weather crop that can take approximately 50-70 days to mature. It grows well in areas that get at least six hours of daily sunlight and have well-drained soil. Broccoli does very well when it is planted in late summer and allowed to grow through the fall. Cabbage – Another cool weather vegetable, cabbage varieties can take anywhere from 55-100 days to grow to maturity. When choosing your variety, it’s important to look at your growing window and the predicted frost dates for your area. Like broccoli, cabbage does best in locations with sunlight and well-drained soil. Spinach – Spinach is another cool weather crop that does well in the Utah fall. Spinach plants prefer full sunlight but will tolerate partial shade. Spinach is a fast growing plant and will yield many leaves in the mild, cool, fall weather. Swiss Chard – Swiss Chard is a plant that can be left in your garden without worry when light frost begins to appear. The leaves from Swiss Chard will add interest to your fall salads. 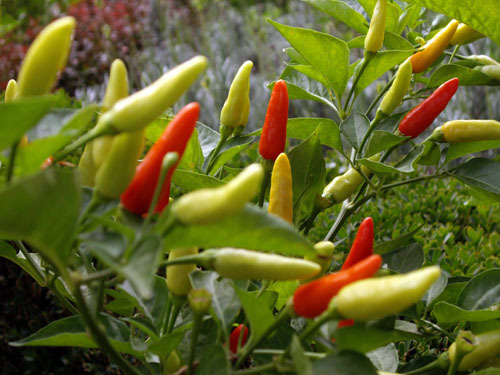 Growing the plant in cooler weather, instead of in the high heat of summer, helps the plant avoid gaining a bitter taste. Your local independent garden centers, like Western Gardens in Salt Lake City and West Valley, Utah, will have the varieties of seeds and seedlings that will do well in the Utah climate. Plan now and come see us. Shop your local independent garden center! Welcome, Friends! Glad you’re here for some tips to organically manage those pesky harmful garden insects so you’ll have produce left to harvest! All yards and allotments will have harmful garden insects every year; it’s part of nature. These insects need to eat in order to feed the beneficial insects. Eliminating ALL the harmful insects from your garden would be time, labor, and resource intensive. You also run the risk of depleting the food source for beneficial insects and other animals that feed on the harmful critters. Wise Goal – An important and wise goal is to control the harmful garden insects enough to reduce the damage to your garden to a manageable level. Meaning that by harvest time, there is something left for you to eat. Losing one or two tomatoes is manageable and probably hardly noticed, but an entire decimated crop means there’s a problem to address. 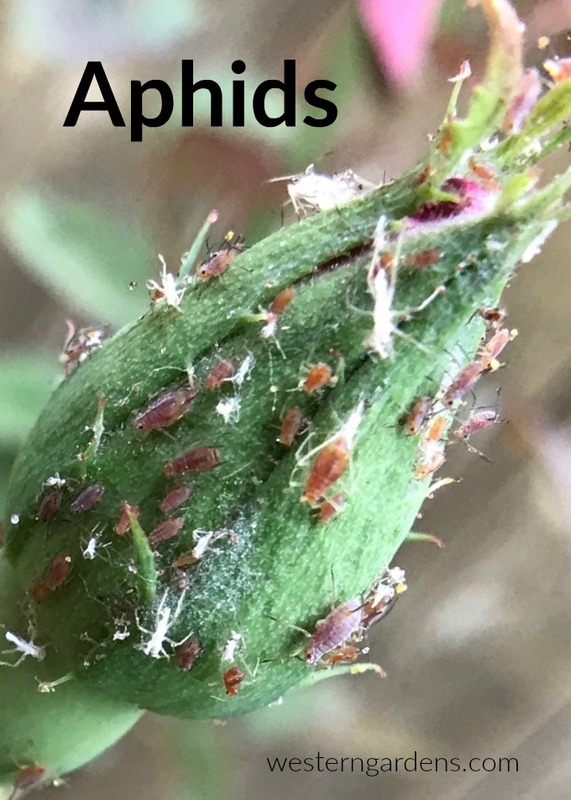 Aphids – One year we had aphids on our herbs which was easily treated by spraying the affected plants with neem oil, a wonderful organic product found at Western Gardens. This significantly reduced the number of bugs. They were further kept at bay by some helpful ladybugs, also found at your garden shop. We were careful to thoroughly wash our herbs before eating them to remove any remaining aphids. Washing anything you harvest before eating it is always a good idea anyway. 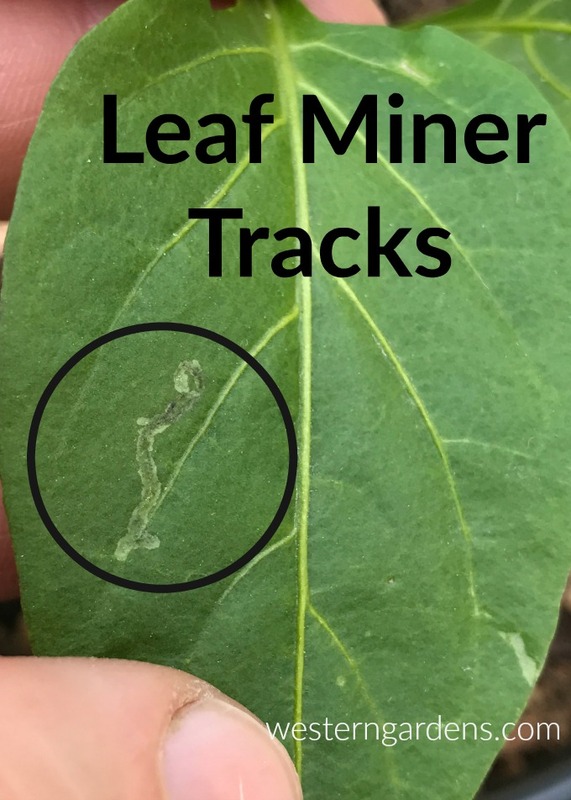 Leaf Miner – Last year, our challenge was leaf miner larvae on our Swiss chard. In this case, we simply discarded any leaves that had been extensively chewed. Otherwise, we snipped off the parts that didn’t look as appetizing, like anything that had a visible egg attached to it (usually on the underside of the leaves), washed everything, and then enjoyed our tasty green salad. 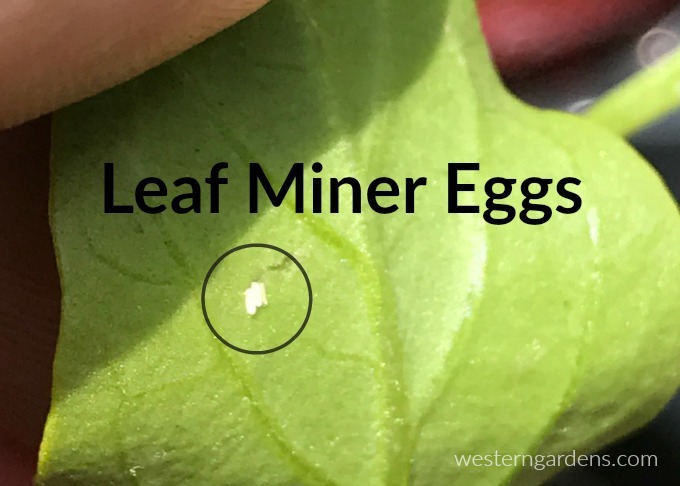 This year, now that we know to look for the leaf miner eggs on the leaves, we were more attentive with our starts for our garden and inspected them daily, looking for them or other harmful garden insects. We found eggs on our pepper plants and did our best to remove them when the plants were small. We used a piece of duct tape wrapped around a finger to remove the eggs. We found that using a gentle fingernail was still too rough for the tender young leaves, so gently touching the tiny eggs with the sticky duct tape easily lifted them off. Once the plants were more mature and could withstand a little insect activity, we were less vigilant at egg removal, but still mindful of looking for eggs once in a while. 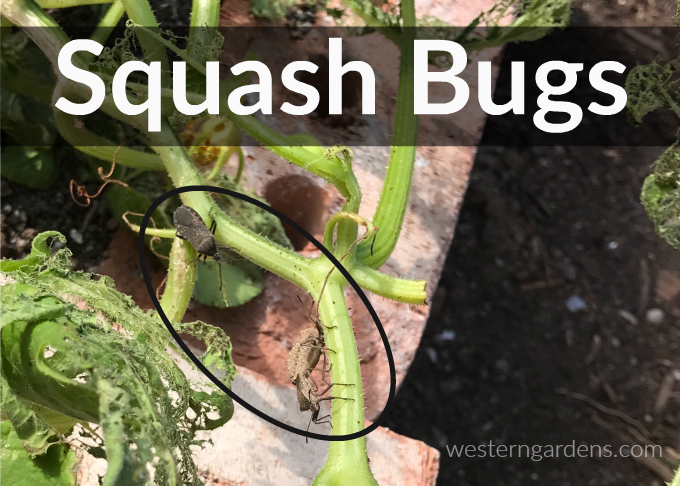 Squash Bug – This year, we planted pumpkins for the first time. We had heard of the dreaded squash bug and had been looking for them but hadn’t seen any damage to the plants. Then, just last week (late June), one of our pumpkin plants was nearly devoured overnight by something. We assumed it was the infamous squash bug. 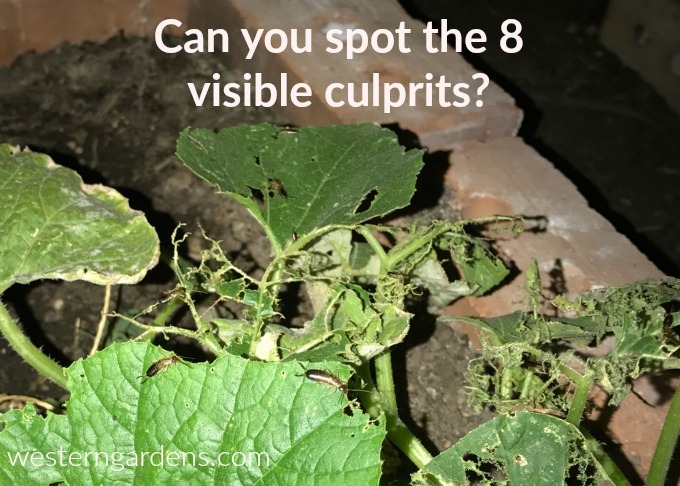 This assumption was reinforced when, upon closer inspection of the plant, we found a mating pair of squash bugs with a third one waiting on the side-line and eggs attached to the underside of the remaining leaves and the stem. We posted photos of the damage to a Facebook gardening group and learned of some other likely culprits. That night my husband went out with a headlamp and a bottle of neem oil to investigate. Earwigs – Someone suggested the damage looked like the work of earwigs. My husband found several earwigs eating on the plant and a swarm of them hiding in a nearby crevasse. 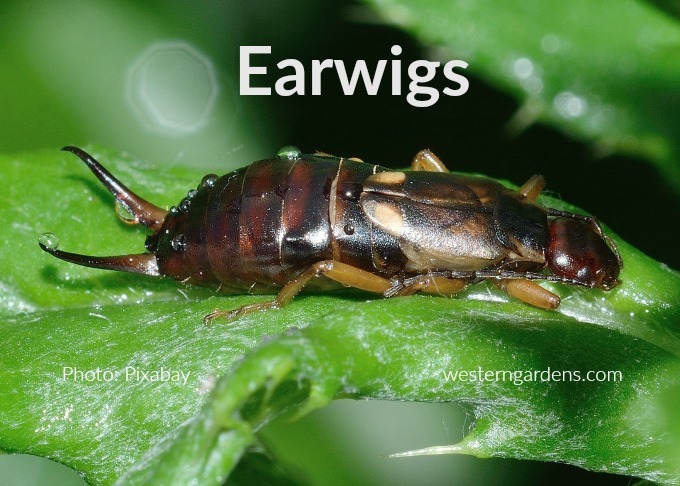 Earwigs are a complicated insect in the garden. They are not only harmful, but also beneficial. They aid in breaking down organic matter (composting) and they also eat aphids and other harmful insects. However, when there are too many of them around a young susceptible plant, they can be very destructive. We could also see evidence of earwigs damage on a few leaves of nearby tomato plants. This minimal damage doesn’t pose a risk to a plant that has hundreds of leaves to perform. In comparison, the pumpkin plant had only a dozen leaves to start with and most of those were very damaged. My husband sprayed neem oil on the earwigs on the plant, in the swarm nearby, and even in their nest. It’s still uncertain whether the plant will survive though it already shows signs of new growth. We monitor it closely to prevent another insect attack that would probably kill it. Another organic alternative that works to kill earwigs is diatomaceous earth, which also now offers a nice dispensing bottle which helps cut down on waste and mess. Check it out at Western Gardens. As for the squash bugs, not the main culprits to the pumpkin plant, they were probably snacking on it also. 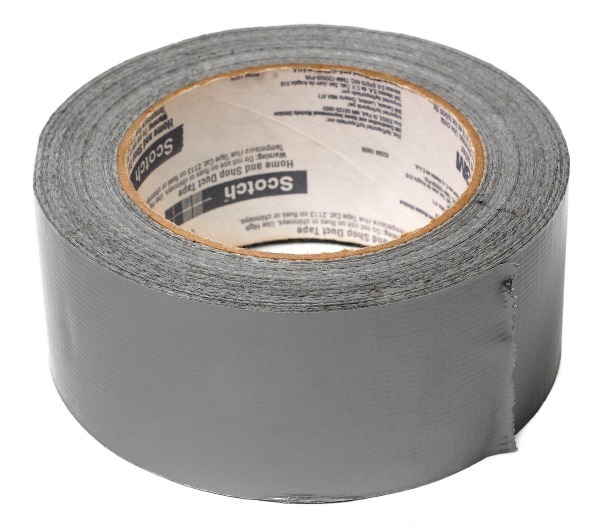 We’re still removing eggs as we find them (using the duct tape trick mentioned above) and killing any adults. Their numbers can quickly get out of hand. Again, diatomaceous earth works well to control squash bugs. 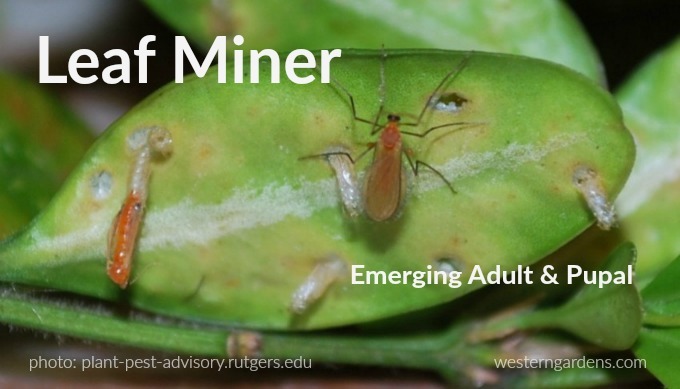 Beneficial vs Harmful Insects – Lady bugs, praying mantis, and birds are a few examples of creatures that feed on the harmful garden insects; hence, we like to see these around around the yard. When considering how to handle any harmful garden insects, the first reaction should generally not be total annihilation. Rather, try to reduce their numbers and also allow the beneficial insects and animals to do their part until the plant is mature enough to withstand the damage. CLICK HERE to read about beneficial insects you want in your garden. WELCOME Gardener, Happy to see you here checking out a delicious Homemade Ketchup Recipe for all those tomatoes you are growing! Are you looking forward to summertime and all the amazing foods summer brings? I love picnics and bbq-ing, basically anything that allows me to eat outside and on dishes I don’t have to wash afterward. One consistent condiment is ketchup, it seems like ketchup goes with just about every summertime meal. I love trying new recipes, especially recipes that are simple and include items I always have on hand. Every year we plant a variety of tomato plants and I enjoy using them in the summer and fall. Unfortunately half of my family are not tomato lovers so I find myself giving tomatoes away so they don’t go to waste. This year I am determined to learn how to can tomatoes so I can use them all year round and they’re perfect for this Homemade Ketchup Recipe. *Place all ingredients into a medium-size pot. *Bring ingredients to a boil over medium-high heat. Once boiling turn down and simmer for 60 minutes. *After 60 minutes remove from heat and let cool to room temperature. *Once cool pour into blender and blend until smooth. *Pour into air-tight container and place in refrigerator for up to 14 days. While this recipe isn’t the quickest it is quite possibly the simplest recipe you’ll find out there and it is delicious. I highly recommend making it a couple of days ahead of time, if you can, the more time the flavors have to blend the better it will taste. I love the rich flavor, I personally love that you can taste more of the tomato flavor and my family all loved it, even the tomato haters, so you don’t have to worry that the flavor is too strong. I’m excited to bring this delicious ketchup to all our summer gatherings, I can’t wait to try it in homemade fry sauce too! If you’re planning a bbq this summer or attending one, you need to try one of these amazing salads that are serious crowd pleasers! 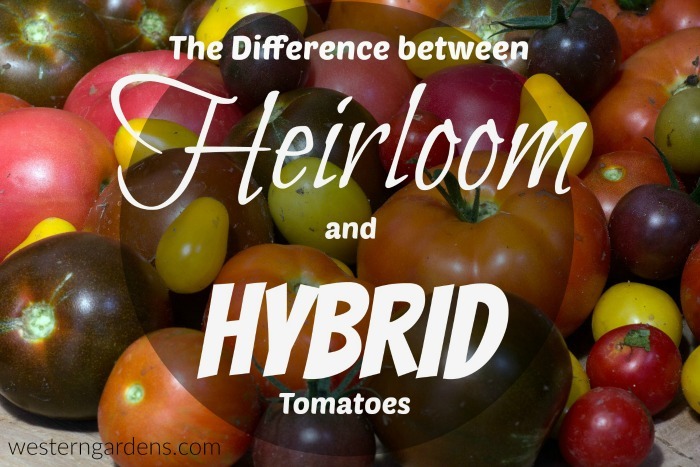 When we first started growing tomatoes several years ago, I didn’t know the difference between heirloom and hybrid tomatoes. I had heard about heirloom tomatoes and wondered what that meant. To me, an heirloom tomato sounded like some prized family possession (like great-great grandma’s china plates) or some secret family seed (like that secret family recipe for chocolate cake) that had been passed down from generation to generation. Basically, it made them sound unattainable without a special connection to someone from a family that had been growing tomatoes for countless generations. That was my impression. So, I simply went about my business of buying tomato starts at the local garden centers. I didn’t hear the term “hybrid tomato” until a few years ago. Hybrids were the kinds of tomatoes I’d been growing but didn’t know it. As the push for more natural and organic ways of producing food has been growing, the market for heirloom tomatoes has become much more mainstream. One can buy packets of certain varieties of heirloom tomato seeds at pretty much any gardening center and starts for heirloom tomatoes can also be found in more locations. What’s the difference between heirloom and hybrid tomatoes? One way to define an heirloom tomato is a variety that has been passed down within a family or has been around for at least 50 years (though it seems there is some controversy about how old a variety of tomato needs to be in order to be considered an heirloom1 ). Some heirlooms are recorded as having been cultivated for hundreds of years or more. An HEIRLOOM TOMATO is one that has been selectively reproduced for certain characteristics, perhaps a certain trait that is best suited for a growing region or a certain color or flavor. It may be the best one for canning/bottlings because of its acidic content. Or maybe a variety that is huge and juicy, where one slice fills an entire sandwich! Some varieties of heirloom tomatoes include Black Beauty, Brandywine, Chocolate Stripes, Green or Red Zebra, Big Rainbow, and many more. As the names would suggest, heirloom tomatoes come in a wide variety of shapes, sizes, colors, and flavors. Many would argue that heirloom tomatoes are more flavorful. I have personally grown Brandywine for several years and can attest that they are delicious and juicy. They also can grow to be quite large, but the same vine could also produce medium or smallish fruit. They are not completely consistent in size, but always tasty! A word of caution: Watch your heirloom tomatoes and don’t let them over-ripen on the vine. Since the colors of an heirloom can vary so much from what most people are used to, like that “tomato red” we all see on hybrid varieties we buy at the grocery store, it can be quite easy to not know an heirloom is ready for harvesting until it’s too late. Read up on the particular heirloom tomatoes you choose so you can be aware of what to watch for to assess ripeness. A HYBRID TOMATO is one that is the result of intentionally cross-pollinating two different varieties of tomato. This means the “child” plant will have characteristics of both of the “parent” plants. 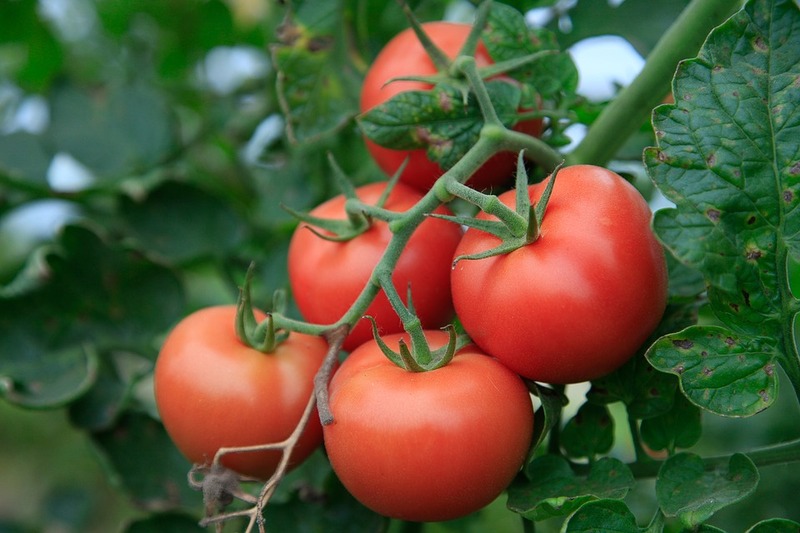 These tomatoes can be very hardy, disease resistant, and produce fruit that is consistent in size and shape. Being disease resistant is probably the biggest and most important benefit. There are few things as frustrating as growing a big beautiful plant, have lots of fruit forming, then get a plant virus that destroys your crop. Some popular varieties of hybrid tomatoes are Big Beef, Cherry, Sweet 100, Early Girl, Better Boy, and Grape. …is what kind of 2nd generation fruit will grow from this year’s plant. You can’t be certain what kind of tomato will grow from the seed of a hybrid. Often the seeds are sterile and will not sprout at all. In the event that they do sprout, they probably won’t be the same as the plant you harvested them from. We planted a Cherry tomato two years ago and had lots of volunteer plants growing in that area of the garden the next season. We let a few of them grow and found that the plant produced fruit that was pea size, or smaller! They were delicious but a real pain to harvest. Be sure to check your local independent garden shop, like Western Gardens in Salt Lake City, to find the most popular varieties that will do well in your climate and area. The locals will have the biggest variety and most unique varieties for you to enjoy. Either way, the difference between heirloom and hybrid tomatoes may not matter to you. Nevertheless, whichever you chose to plant in your garden, they have one big thing in common: they are designed to be eaten and enjoyed! Welcome Zucchini Lovers. Celebrate with us! You are just in time for National Zucchini Bread Day! If you included zucchini in last summer’s garden then there’s a good chance that your freezer is well stocked with leftovers from last year’s harvest. This easy to grow squash is notorious for producing more crop than gardeners know what to do with. If you still have a ziplock bag, or two, of frozen zucchini hanging around then you’re in luck! Now is the perfect time to defrost your zucchini leftovers because April 25th is National Zucchini Bread Day. Who doesn’t love an excuse to celebrate a national food day? With zucchini bread you have a way to satisfy your craving for warm carbohydrates while also getting in a serving of vegetables. Not to mention fiber! It’s always a plus when your fiber comes in the form of delicious bread. As an added bonus you’ll be able to either use up freezer leftovers or have an excellent excuse for finally starting your garden. If you don’t already have zucchini in your freezer, don’t panic. Pick up the produce at your local store and use fresh zucchini in your bread recipe. Then head to the garden center for seeds and celebrate National Zucchini Bread Day by planting something that you will enjoy both in a few months time and at next year’s celebration! Quality seeds for a successful crop! Choose varieties that will thrive in your area. Mid May happens to be an excellent time to plant zucchini seeds because the ground has begun to warm up. You can also begin your seeds indoors, but if you want to direct-seed and avoid transplanting then it’s best to wait until the soil temperature measures around 60-degrees. Check with your local independent garden center to know when it is ideal for planting your seeds. In Utah along the Wasatch Front, gardeners remember Mother’s Day as the time when the rest of the garden can be planted. Cold crops can be planted as early as March. Zucchini is definitely not a cold crop. In the fall, if your plants have done well, you will most likely find yourself giving away zucchini. To friends, neighbors, coworkers, maybe even strangers. Even after all that generosity you should still have plenty of zucchini left to freeze for the following year. Preserving the squash is easily done. Wash the zucchini in cold water, pat it dry, then cut off both ends. Use a cheese grater to grate the plant and then store the grated zucchini in a well-labeled ziplock bag in the freezer. The vegetable should keep in the freezer for approximately eight months. 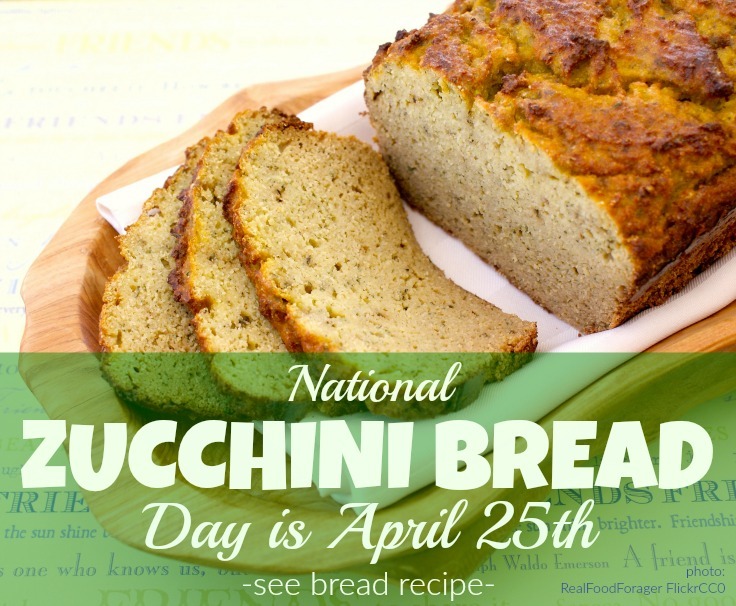 Which means you’ll be prepared and ready to bake when National Zucchini Bread Day comes around again! Click next for a simple delicious Banana Zucchini Chocolate Chip bread recipe. It will please everyone!